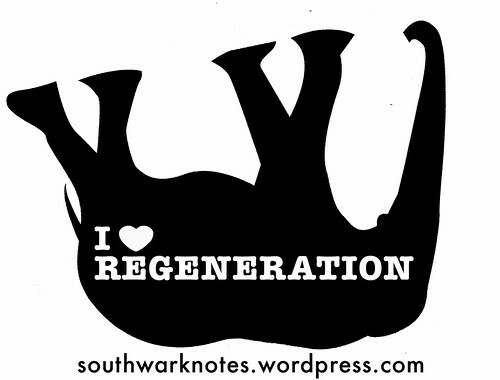 The Affordables | Southwark Notes - whose regeneration? 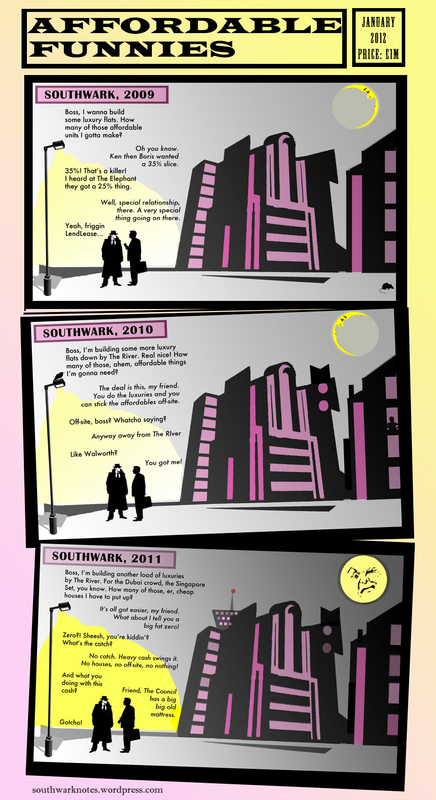 We’re offering a Guest Writers Spot for next month’s The Affordables comic to anyone in the Council regeneration team. 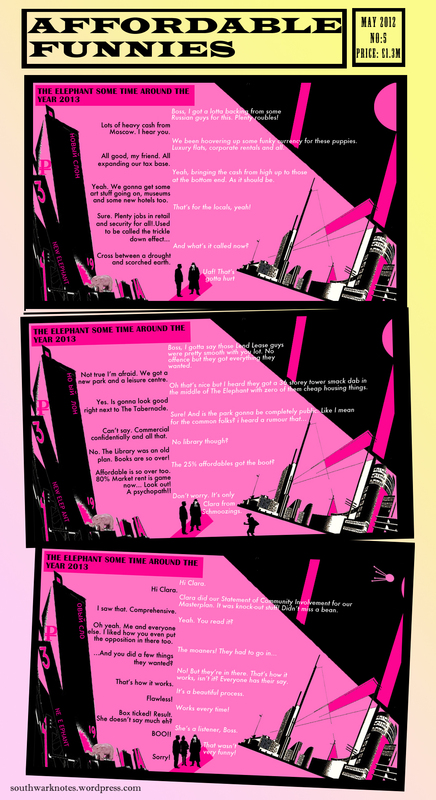 Just email us your three panels worth of dialogue and we’ll do the artwork! Email at the usual address. 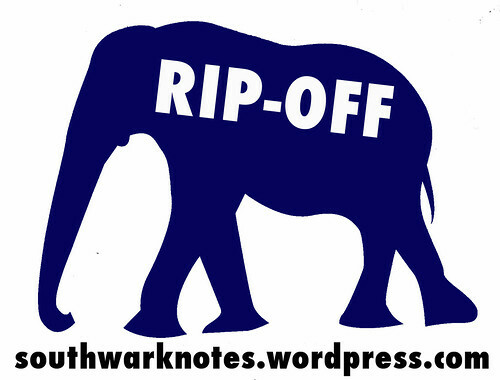 We feel we have to say something to accompany this instalment of The Affordables and it is this – We wholeheartedly welcome the work of the Leathermarket JMB in it’s efforts to get more Council homes built in the Southwark area. This is definitely nothing to be sniffed at. However we remain tired of the much wider Council regeneration agenda and the faith that they put in it to deliver affordable housing on the back of a massive increase in expensive private homes in the area. Destroying structurally sound Council homes as part of that agenda just does not make sense. 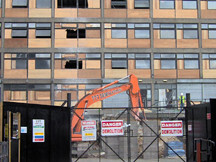 Council records show 5656 council-owned homes demolished in the last 20 years, including leaseholds bought back. 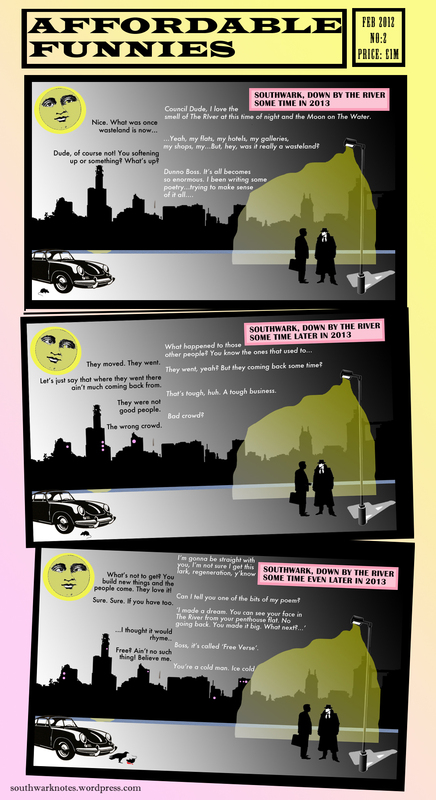 Click comic to view. 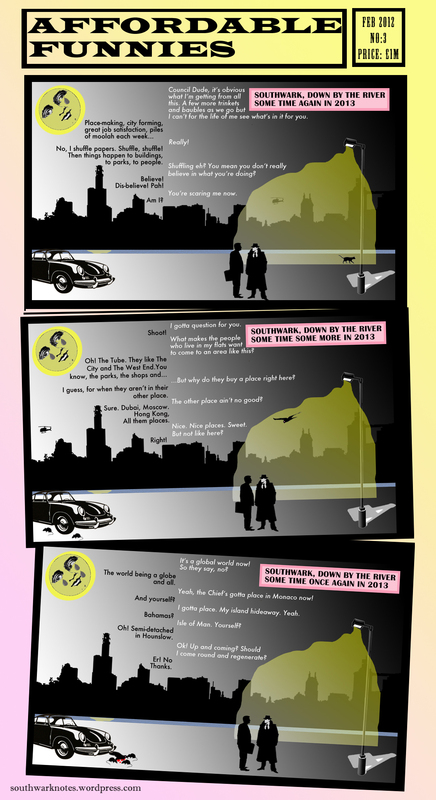 Click again to enlarge! 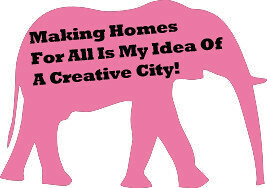 There’s so much going on at The Elephant we have to admit we are overwhelmed. From the presentation of the Lend Lease Final Masterplan Rip-Off Exhibition to the ongoing Leisure Centre decimation. Not only that but possible plans to build 1000 new homes on top of a re-jigged Shopping Centre. Police have been arresting people in The Elephant’s Latino Community as the same time as that community is working hard to establish it’s wonderful presence with pride and dignity. At the same time as holding a big meeting with clueless GLA Deputy Mayor Richard Barnes to express concerns that the Latino community will not benefit from any local regeneration, the police and UK Borders Agency have been hauling people in from the streets and in local latino-run business as part of Operation Condor* and routine nonsense. The worst excess of such dastardly behaviour was the arrest of 90 people who were queuing to get into the famous Puerto Rican Don Omar concert at The Coronet on February 25th. See here for more. 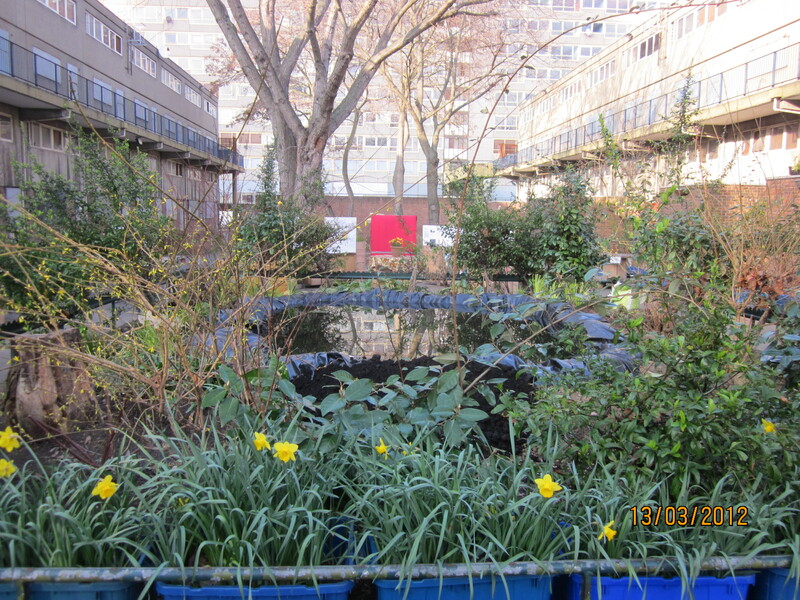 The amazing new fish pond on the Heygate Community Gardens that the Council don’t enjoy! 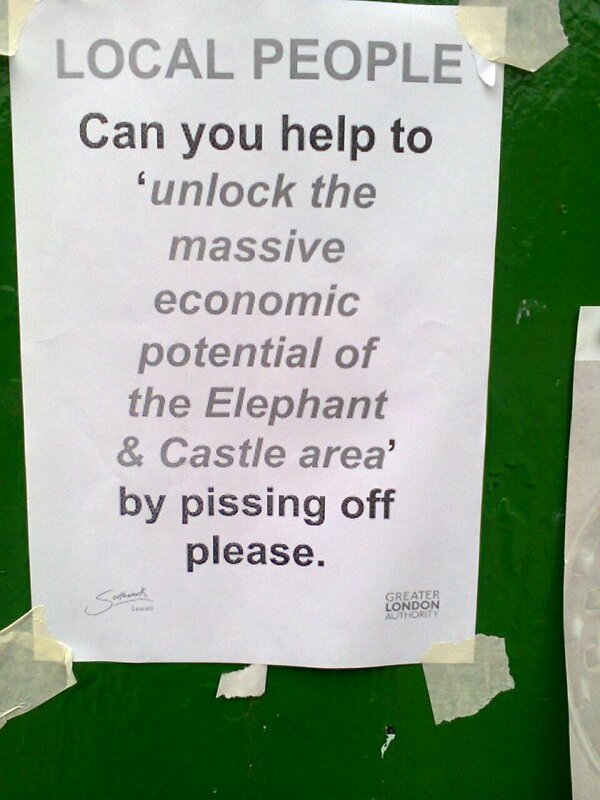 Alongside this we are trying to figure out if The Council actually knows what it is doing anymore with getting affordable housing agreed in The Elephant. 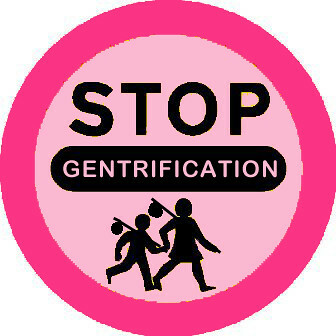 There is also the dubious threat to the Heygate Community Gardens and Allotments that has just started to brew up today – See our March 2012 entry on our Heygate page for the full story or here. 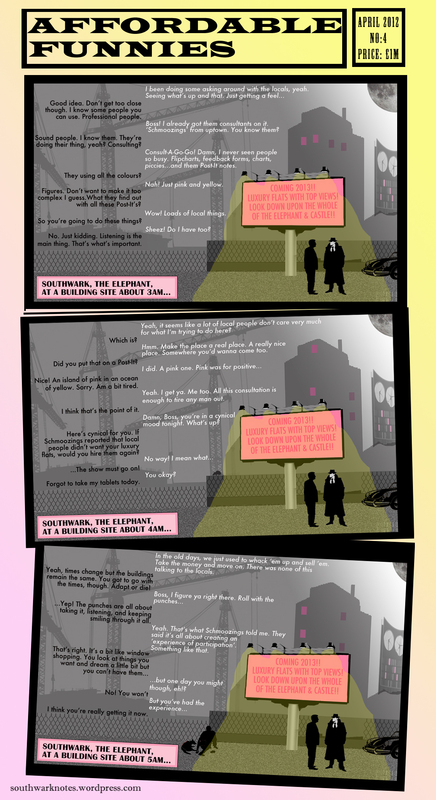 So, in lieu of our usual forthright and sharp analysis we present some of our hare-brained and half-baked ideas in comic format. We hope you enjoy the break. Normal service will be resumed soon! 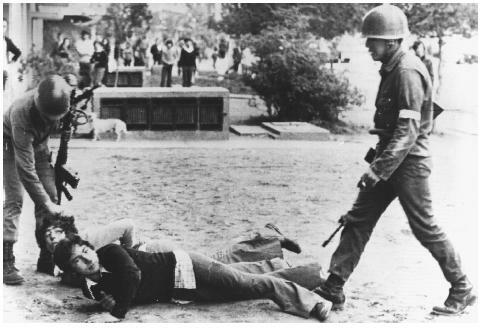 * Operation Condor is not the most sensitive name for any police conduct in a Latino community as it was the name of was ‘a campaign of political repression and terror involving assassination and intelligence operations officially implemented in 1975 by the right-wing dictatorships of South America. Due to its clandestine nature, the precise number of deaths directly attributable to Operation Condor is highly disputed. It is estimated that a minimum of 60,000 deaths resulted from Condor‘. As many of the Latino population of London are exiles and political refugees from those time, or their sons and daughters, we suggest a new name for the Operation might be found. 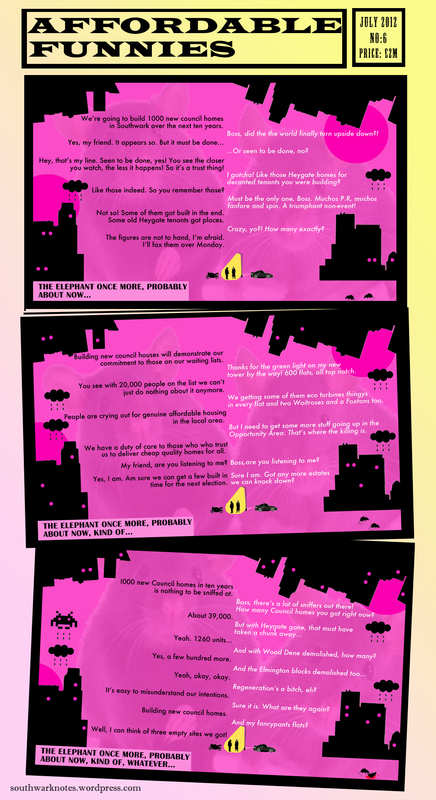 Click on The Affordables Part Two to enlarge! Click on The Affordables to enlarge!